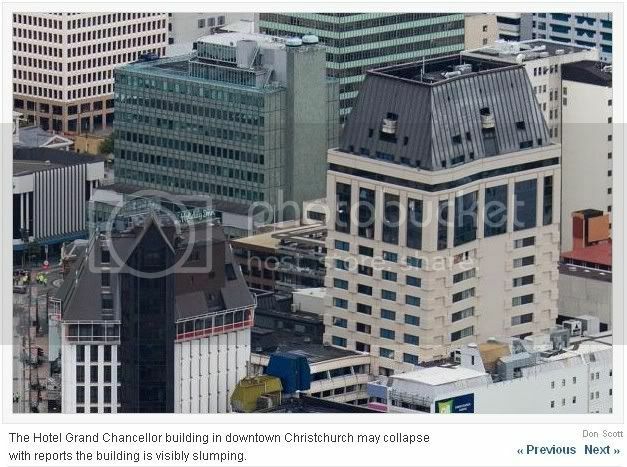 There have been a lot of good photographs taken of the earthquake in Christchurch and its aftermath, but most of them are difficult, if not impossible, to link to; being part of poorly programmed slide-shows on newspaper web sites. Most of these are taken from the www.stuff.co.nz web site. I've included the captions (most of which include the image credits) with the screen captures and will annotate them in a few minutes (just as soon as I've put up this post and remembered which photograph is which). I have chosen photographs without identifiable people in them because I think some of the ones published on the newspaper websites have been an unacceptable intrusion into people's privacy. This first one is a photograph taken during the actual earthquake itself. Someone had the presence of mind to point a camera at the central city just as the dust cloud was beginning to rise. Full version of the above. 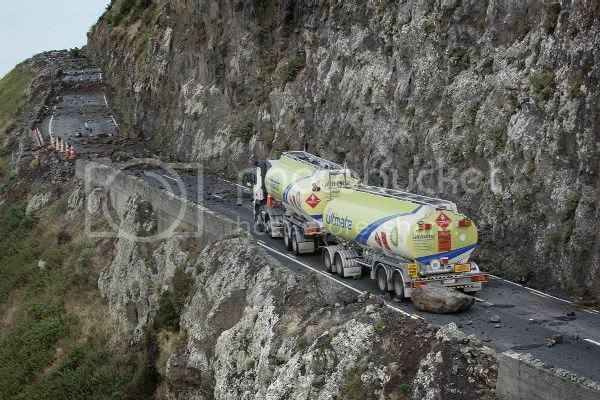 This will have been taken from somewhere on the Port Hills south of the city, closer to the epicentre of the earthquake. Somewhere at the right of the picture - probably just above the left hand end of the (carport? deck cover?) - is where I was born. This Cathedral is in a square in the city centre, the city's most famous landmark and the focal point of the city. Its spire has been destroyed and there's substantial damage to the front of the building. 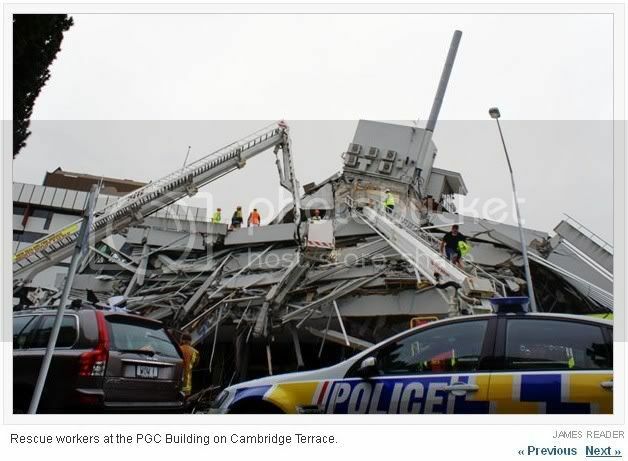 Much of the Canterbury Television building collapsed in the earthquake and a subsequent fire. There was an English language school also in the building. The Pyne Gould Guinness (I have no idea what the "C" stands for) building wasn't that old - 1960s I think - I don't normally think of buildings that recently built as being as susceptible to collapsing in earthquakes as older ones. 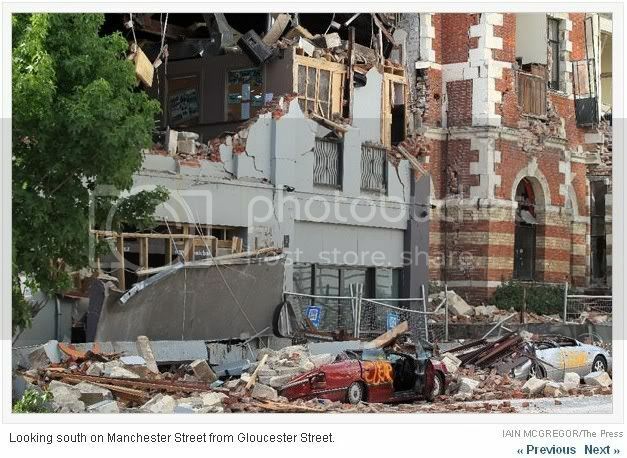 It was only about four storeys tall - not a substantial building for Christchurch these days. 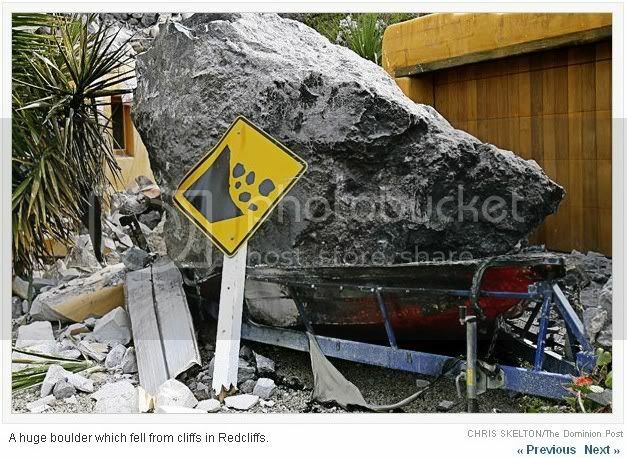 Redcliffs, near Sumner, is a suburb on a clifftop, part of which has now been evacuated due to instability. The Evans Pass Road is closed and blocked; with the Lyttelton Tunnel also having been either closed completely or closed to all but emergency vehicles over the past few days, the only vehicle access to Lyttelton has been via Governors Bay. Lyttelton itself is probably best known internationally (at least to people likely to be reading this) as the setting of the movie "The Frighteners". 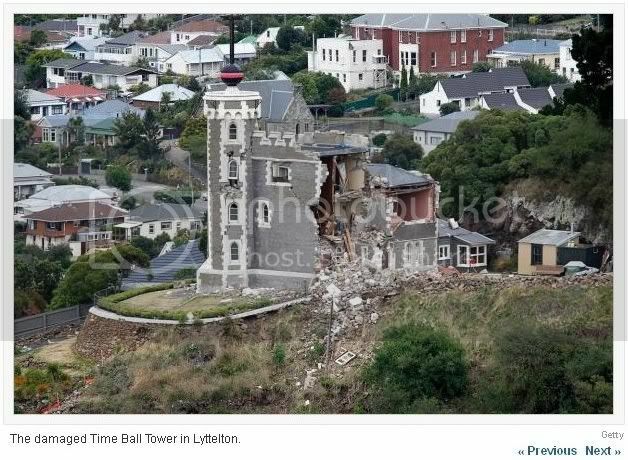 This image is of one of Lyttelton's most individual buildings, the time ball station. I remember back some time in the 1970s when the family were visiting Christchurch, going to see Lyttelton and arriving just at the right time to see the time ball being raised and lowered. 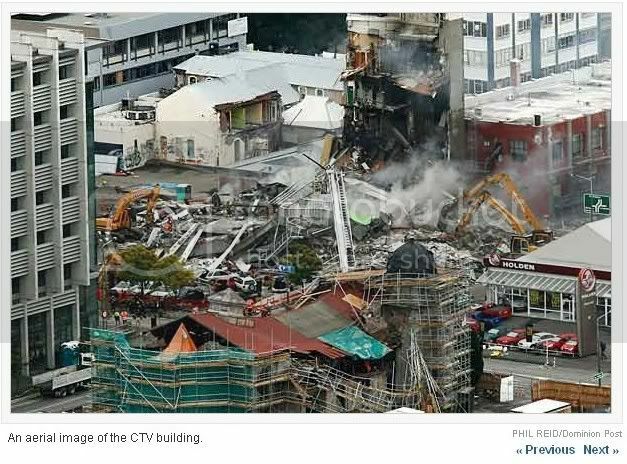 Lyttelton was very close to the epicentre of the earthquake and much of the town's central business district has been badly damaged. Just by its name, the Provincial Council chambers would have to be at least 135 years old; the Canterbury Province was abolished in 1876. At the other end of the age scale, the Hotel Grand Chancellor is only about 15 years old and seems to be unsalvageable. It's the structure at right of the photograph - the warp is not a fault in the photograph, it's structural damage to the hotel. At one point this week it was looking like it could have collapsed at any time - there was something like a metre of movement in the space of about an hour - but it seems to have stabilised for the time being. At 26 storeys tall - one of the tallest structures in Christchurch - it's going to be a massive job to clear the site without more damage. Manchester Street is one of the most famous streets in Christchurch, parallel to and one block east of Colombo Street, the main street through the city centre. Apart from its notoriety, it was also (the last time I visited central Christchurch - I didn't go there during my visit late last year due to lack of time and that there were still many streets blocked off other than to residents due to damage from the 2010 earthquake) home to at least two bookshops, one comic book shop and one stamp shop. The stamp shop I know to have closed some years ago (much of the stock was sold to a North Island stamp dealer, and another company has taken over their catalogue publishing operation) but I don't know the status of the others. Thanks for posting these, Dave. I've seen barely a whiff of anything in the US media on it. This is utterly devastating to look at. Thanks for posting the pictures. I've looked at a few of the (as you say, rather intrusive) photos, but they mainly show very unhappy people. The accompanying article would *talk* about a big rock that rolled through, or a new-ish hotel that may need to be torn down, but no pictures. The pictures remind me of pictures from the San Francisco Bay Area after the 1989 quake. sighs..a question from a coworker the other day..how many people were in that church I keep hearing about. I don't think anyone's sure yet. I vaguely recall that someone estimated about 22 tourists to have been in the Cathedral when parts of it collapsed, but they probably wouldn't all have been in the spire area. Presently they're still recovering bodies from some of the collapsed buildings so police and civil defence people would quite understandably be getting that done before tallying up numbers. Currently there are something like 200 people thought to have been in the earthquake and still unaccounted for. 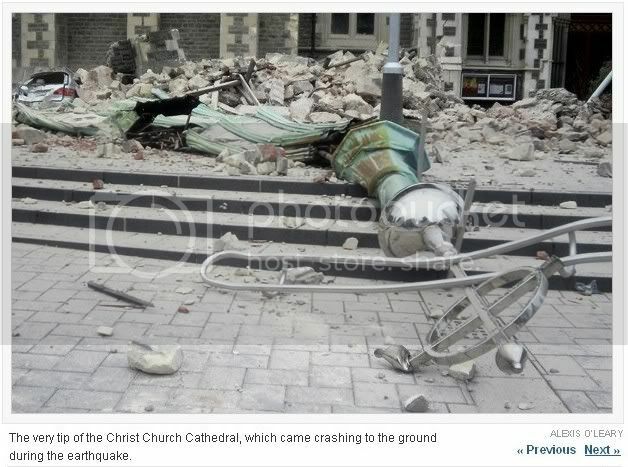 But in this case they thought Christchurch was...a church. Not a city...but a Church out in the countryside. In that case, the answer is "about 375,000". Big church. It's generally thought of as New Zealand's second largest city, these days, although its placing probably depends on where the Wellington boundaries are drawn (the main Christchurch urban area is fairly discrete, while the Wellington urban area is spreading up the lower North Island in thin ribbons along the coastline and up river valleys). ahh sweet demographics. We have an urban population here of roughly 450,000 (Cincinnati is very limited in how it can expand) but a metropolitan population of roughly two million. All in how one looks at it. The news here, what there has been, has been referring to Christchurch as the second largest city. Thanks. The pictures are grim, but earthquake pictures always pick out the worst damage. The cathedral in the picture is the Anglican Christ Church Cathedral (yes, two words, while the city is one word. Don't ask me why). ... It never occurred to me to specify that it was Anglican because I always just understood "Christchurch = Church of England, Dunedin = Free Church of Scotland" for the two main South Island settlements and plain forgot that not everybody grew up in the South Island. 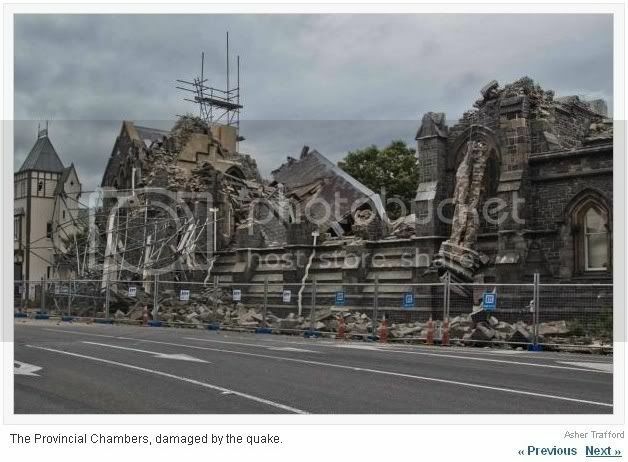 There are many damaged church buildings in the central city area; I think I saw at least four different ones on the newspaper slide shows that I took these photographs from. 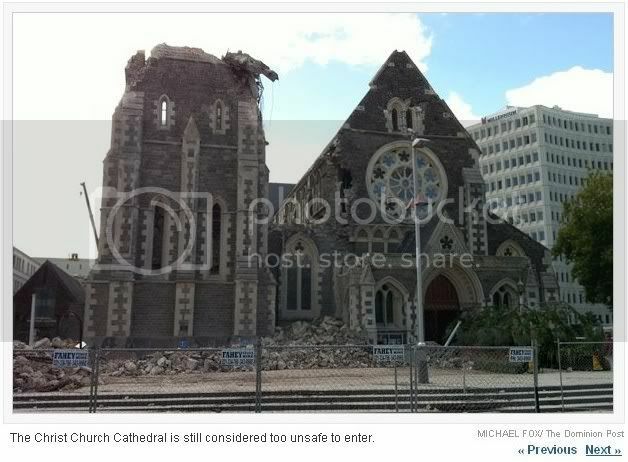 The main Presbyterian church in the city is also badly damaged.